Five more players have signed one-year deals with Cheltenham Town, including Keith Lowe who returns to the club. 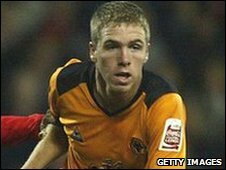 The 24-year-old defender played on loan for the Robins in 2006 and 2007, and joins after being let go by Hereford. "It's good for the club; we want people who care about the place," manager Mark Yates told BBC Radio Gloucestershire. The club has also given academy products Theo Lewis, Kyle Haynes and Jake Lee, all 18, and 19-year-old Josh Emery professional contracts. Lewis had a run of games in the first team last season, making nine starts and eight appearances as a substitute. He scored his first goal for the club away at Torquay in the FA Cup. Haynes played a similar number of games and also won the Apprentice of the Year award for League Two, while Lee and Emery have featured five times between them. "They've done the first bit, they've got themselves a professional contract," Yates said. "They'll be a big part of the squad. It's a great chance for them to be part of a young squad anyway, and hopefully one or two of them can force their way in to the team." Of Lowe, he added: "I'm delighted to have got him - he's a player I know well. He's a good defender, comfortable on the ball, and very mobile. "He's been here before so he knows the place; he knows what the club is about. "It's a big part of what will be a young squad anyway but hopefully one that has no fear and no inhibitions."